and my faves are always the party themes! the 'official' start of summer is on the horizon! don't you agree that summer parties should be EASY to pull together? uncomplicated? fun? whimsical? and inexpensive? i thought you would! so let's use stuff we already have - nothing precious or expensive, just simple. i even included colorful glass watering globes for a quirky accent! or just buy some new ones filled with Coke and drink it! TIP: wash old bottles with HOT water, a squirt of lemon juice, and epsom salt. swirl the solution around inside the bottle, and the salt will scrub the bottom clean! i even have a way to use the cardboard carrier that those bottles come in! load it up with napkins and flatware for an easy way to corral them on a table or buffet. or, fill the compartments with condiments for burgers & hot dogs off the bbq! 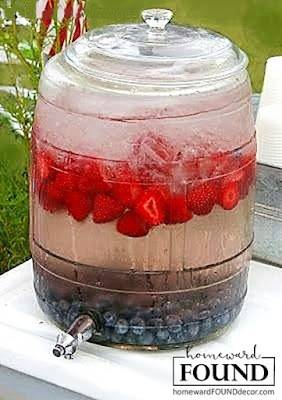 this flavored water creation is my most popular pin EVER from this blog! just put frozen blueberries into a container, add cold water and ice, then fresh strawberry halves. the layers stay separate and the effect is red, white & blue stripes. it's a beautiful way to offer water to your guests - and a patriotic addition to your summer soirees!